GoAccess allows you to monitor web server logs in real time, using a simple command-line dashboard, in order to quickly view and analyze traffic metrics. It runs entirely in a terminal with statistics organized into separate panels on one scrollable dashboard. It is also possible to use GoAccess to generate HTML, JSON, and CSV web traffic reports. This tutorial shows how to install the software from source, and then demonstrates how to use, view, and navigate the program on the command line. GoAccess will work with log files from almost any other web server. However, the log file's specific formatting must be defined in GoAccess for it to function properly. This guide will focus on using Apache as the chosen web server, with or without virtual hosts configured. Please complete these prerequisites before starting this tutorial. User account on the VPS with sudo elevation privileges. The more web traffic the VPS handles the more data GoAccess has to work with – more is better in this case. To begin, ssh into your server as a user that has sudo elevation privileges. Then follow the steps below. This command updates the apt-get package manager's database. Install any new updates to the Debian system packages. The build essential package provides several very important subsidiary packages such as make that are required to compile software in Debian and Linux. These are a necessity for the installation stages of GoAccess later on in the guide. Here are the dependencies needed to install and use GoAccess on your VPS. Acquire them using the apt-get package manager. Now that we have the necessary system packages in place, we can obtain and build GoAccess. GoAccess is in release version 0.8.5 for its stable build at the time of writing. To download it, use the wget command below. Now the tar command can be used to extract and unpack the downloaded .tar.gz file and its contents. Change into the newly unpacked directory like so. Use the make command to build the makefile required for installing GoAccess. The following command will install GoAccess (using the previously created makefile) to system directories, making it executable via Debian. There are several lines commented out in GoAccess's main configuration file that we need to uncomment in order to use some advanced features of the program later on in the tutorial. A comment in this configuration is denoted by a # and means the server will ignore the subsequent information on the same line after it. In this file we need to remove a total of two # symbols to uncomment two lines. The first is the date-format setting and it appears here like this. # of the Apache's log formats below. To remove the comment symbol (#) press j multiple times to drop your cursor down to the line we want to edit, which is the date-format %d/%b/%Yline. Once it reaches the line and is selecting the # press x to delete and remove it. Note: You can press ESC and type :q, then ENTER to quit the file without saving your changes, if you think you have made any mistakes or accidental alterations. The second line that needs to be uncommented is one of the log-format lines, and the exact line depends your Apache setup. Choose the first option if you are running just one Apache host, and the second if you have virtual hosts set up. If you're not sure, you should probably follow the "Non-Virtual Hosts Setup" section. Warning: Uncomment only one of these lines. For a setup without virtual hosts, remove the following line's hash (#) symbol in the same way as before. For a setup with virtual hosts, remove the following line's hash (#) symbol in the same way as before. log-format %^:%^ %h %^[%d:%^] "%r" %s %b "%R" "%u"
After uncommenting one of the log-format lines, press ESC. Then type :wq and press ENTER. This will write the changes we have made to the file and quit the vi text editor. We can now run GoAccess on any plain-text Apache log files that meet the supported formatting criteria. Let's add our current user to the administrator group (adm) in Debian so we can run these commands without needing the sudo prefix for root user permissions. usermod can change our user's properties by including the -g argument and the group name we wish to add to (adm), followed by the user in question (in this case sammy). Make sure to replace sammy in the next command with your own Linux username. After running the above command, disconnect from your VPS by typing exit and then ENTER. Then log back in to the VPS with your sudo user. This is so the changes we made earlier to the user with usermod take effect. You should now have the correct permissions to run GoAccess as this user without using sudo, and also have access to the Apache logs directory. Now we'll locate the logs directory. Web servers in general record all incoming and processed HTTP requests to log files. Here you will find the log files described previously, some of which are compressed into .gz files if your server has been running long enough. The most recent one that is currently being written to and handled by the web server is the one that is uncompressed named access.log. For a setup with virtual hosts configured, you may have to cd into sub-directories from within /apache2 to locate each individual host's log files. If you have found the log files here, then move on to the next step (Step 11). You only need to read this further information if you are having trouble locating your log files. The location of these access logs are controlled by the CustomLog directive in Apache's config. If you altered this setting, you may find your your Apache access logs in a different directory. To find the CustomLog directive and what it is set to, you can use grep on one of the Apache config files, as shown in the next command. This will output any custom directories added in the apache2.conf file. This will show all files on the system named access.log. Once the directory with your Apache server log files is located, you can run GoAccess on them with the next command. In this command, make sure to replace /var/log/apache2/access.log with your own log file directory path, if it is different from the standard Apache one. Once you run this command, you'll see the GoAccess dashboard. The -f argument tells the program to use the supplied directory path, and the -a argument enables all recorded statistics for each host agent parsed. If you want to run GoAccess on older logs — the compressed .gz type files — they must be extracted and unpacked. The program will not run on these compressed files with the command shown above. You can do this extracting with the gunzip program in Debian if desired. The access.log.10.gz file name at the end of the command here will need to match the compressed file name you want to extract. This is the GoAccess dashboard. Pressing F1 or h will bring up a small help window, listing the keys and their functions found here in this section, as well as provide some other helpful information. 0-9 or SHIFT + 0-9 selects the respectively numbered module and sets it to active. The corresponding numbers can be seen on the dashboard for each section. o or ENTER is used for expanding the currently selected module on the dashboard. Modules are explained in the next section. j will scroll down within an expanded active module, and k will scroll back up within an expanded active module. s shows the sort options available for the active module. Finally, pressing q will quit the program or current window, or collapse an active module, depending upon your current level of depth in the dashboard. Pressing the TAB key on your keyboard will move forward through the modules in order. Pressing SHIFT + TAB together will do the opposite of the last action, and iterate backward through the modules. F5 can be pressed to refresh and redraw the dashboard. c when pressed sets and alters the current color scheme in use on the Dashboard. g moves the focus onto the first item and back to the top of the dashboard screen. G scrolls to the last item or bottom of the dashboard screen. Now that you can move around the interface, let's take a look at what each module actually contains. The sections here correspond to the numbered modules and titles in the program. All "Hit" values displayed are based on the total amount of requests found in the supplied log file or files respectively (unless stated otherwise). The dashboard shows the number of: valid requests, invalid requests, time taken to analyze the data provided, unique visitors to the server, uniquely requested files, unique static files (usually images file types), unique HTTP referrers (URLs), unique 404 not found errors, the size of the parsed log file, and lastly any bandwidth consumed. This module is listed by day with dates included. HTTP requests possessing the same IP, the same date, and the same agent are considered as a unique visit. This includes web crawlers/spiders. Requested Files shows the most highly requested files on your web server, and displays said hits as a number, and percentage, along with the time the host was served for (bandwidth), what protocol was used, and what request type was used. Includes only static files requested most frequently such as: jpg, css, swf, js, gif, and png file types, with the same metrics as the last module provided for each occurrence. Ranked like previous modules with the same statistics, this module lists the top recurrent HTTP 404: Not Found Error requests, and the URL that is being requested. Hosts has more detailed information on the hosts themselves that connect to your web server, such as number of connections, their global IP addresses, and some of the same repeated metrics types. The expanded module here can display even more information like a host's reverse DNS lookup result, and country of origin, if the -a argument from earlier is enabled. A list of user agents can displayed through selecting the desired IP address, and then pressing ENTER. Here the host's operating system is shown, and OS usage is ranked. This is based on unique visits, unlike most of the other module data. The Browser module follows the same concept as the last module, except in this case the host's browser type used to connect a session is ranked instead. Again, this is based on unique visitors, and not total requests overall. If the host in question accessed the site via another resource, or was linked/diverted to you from another host, the URL they were referred from will be provided here in this module. This module is nearly identical the the last one (Referrer URLs); the only difference being that the general site address is displayed, and not the exact point of origin for a referral. Reports key words used on Google search, Google cache, and Google translate that have lead to your web server handling a host. At present this only supports Google and no other search engines. This module contains a summary of geographical locations ascertained from visiting host IP addresses. If it's unable to determine the this, it will be marked as location unknown. HTTP Status Codes contains statistics on the the values of overall status codes in HTTP requests, given as an amount and percentage. Move to your user's home directory with cd and ~ to continue through these extra commands. The secondary pwd command prints your current working directory, so you can confirm you have changed over to it correctly. It's possible to generate an HTML report by redirecting (>) the standard output of GoAccess to an HTML file of any name you choose. In this example the file is named report.html and includes all (-a) statistics available from the chosen log file. The newly generated html file is created inside our user's home directory. You can create a JSON type report by adding the -o and json arguments to the command. Here the output file has the .json extension. To get compressed files to run through GoAccess you can pipe the output of the zcat command to the goaccess command. 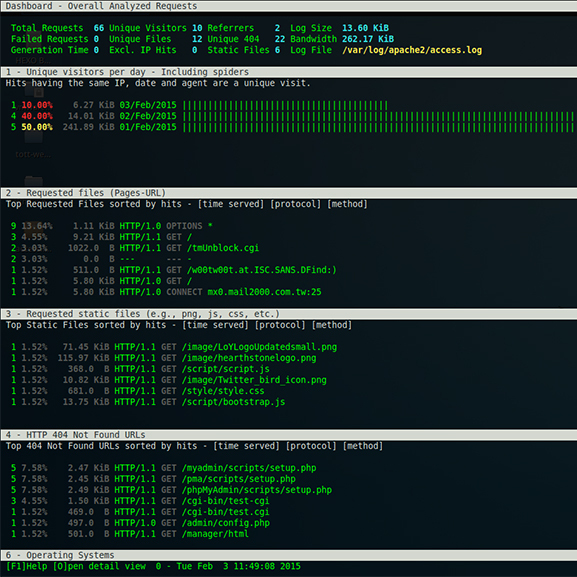 The next command shows all compressed .gz files being read in without manually extracting them first. To filter from a specified starting date, you can use the structure of the next command. This will ensure parsing of HTTP requests from the 20th of January, 2015 until the end of the log file contents. Be aware this will only work if the date you are inputting is actually contained within the passed log file. You can single out a specific date, and filter to show the traffic on just that day. This time we'll use grep to do so. Exclude a specific IP address with this command, replacing 111.111.111.111 with the desired IP address. If GoAccess is installed on a remote machine, such as your local workstation, instead of VPS, it is possible to SSH to your VPS and then read the Apache log files remotely, through piping. After completing this guide, you should know how to install GoAccess, make use of its core functionality, and be able to use several other features that make GoAccess more flexible to work with. Obtaining and updating the necessary Debian system packages. Installing and building GoAccess with its source code. Running GoAccess with Apache web server log files. Interacting and navigating through GoAccess on the command line. Understanding modules in the GoAccess dashboard. Creating different report types from Apache web server logs with redirection. Piping other command outputs into GoAccess.